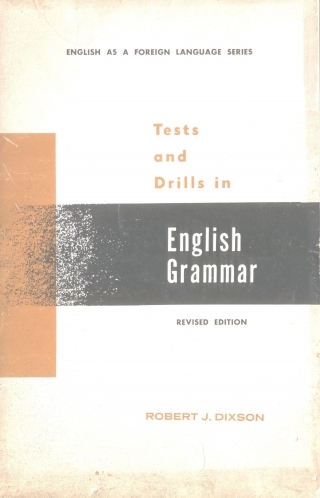 Tests and Drills in English Grammar for foreign students - Revised Edition ... The efficiency of this book will depend greatly upon the skill of the teacher who uses it. The book is planned very simply, so that there is no real problem of organization of materials. Each lesson is so arranged that the teacher simply starts with the first exercises of each lesson and proceeds through the remaining exercises. But the problem arises from the following: many teachers, and particularly the inexperienced teacher, consider the exercises to be simple and obvious, and they are unaware of the profound difficulty of these exercises to the foreign student. It is true that the exercises in themselves are not difficult to do. The theory behind the various grammar exercises is also not complex. English grammar, on the whole, is relatively simple. But the real teaching problem arises from the fact that the teacher must do much more than simply explain the exercises and repeat them once or twice with the students. The students must be taught to use what they are studying. They must be given sufficient practice and repetition so that everything that they study is retained and made an active part of their everyday conversation. This is the basic problem. It may be helpful to the teacher if she keeps the following in mind: Learning to speak a foreign language is more or less a matter of acquiring a skill. It is a skill similar to the skill acquired in learning to typewrite or to play the piano. It is therefore an ability which comes only with much practice and repetition. The theory involved is generally quite simple. One can understand the theory of typewriting, for example, after only a few minutes study of the typewriter keyboard-but to learn to typewrite well then requires months of patient practice. So it is with learning to speak and understand a foreign language. A student can understand the theory of most of the English grammar "principles in this book after a few minutes study-but to be able to use these principles later in speaking English will require constant practice and repetition. How can this practice and repetition be given within the limits of the usual grammar lesson without tiring or boring the student? This is the task of the teacher. First, repeat all exercises several times. Each time go over the exercises a little faster, demanding from the students speed and accuracy. Also, don't try to cover too many exercises each day. Half a lesson is enough for the average class to cover in one day. Second, ask students to close books and then have them do the same exercise orally-possibly several times. You will have to guide the students in this, and some exercises do not lend themselves to this treatment, but it can be done with the majority of the exercises. Third, tell the class that you are now going to ask them some questions using the particular grammar principle involved. For example, if you are studying the exercise on to be supposed to (Lesson 43, rule 87), ask the students ten or twelve questions using this phrase which they must answer. "What time are you supposed to come to class each day?" "Where are you supposed to meet your friend tonight?" "What time is the train for Washington supposed to leave? "- etc. Fourth-and this is very important. In the case of each grammar principle studied, have some simple oral drill of your own invention ready for use. These supplemental oral drills are very easy to develop. For example, if you are teaching negatives, it is very easy to say to the class, "Now I am going to give you a series of sentences orally and I want you to change them to negative form." You then give each student a simple sentence such as "I went to the movie last night", and he has to change it to negative form. If the class has already studied question form, you can also make the students put the same sentence into question form for further oral practice. You can next give them a list of negative sentences and make the students change them to positive form. Any such oral device will serve the purpose of giving the class additional practice in using what they are studying. On the elementary level the drills can be very simple. On the advanced level, with a little imagination, they can often be made quite interesting as well as practical. For example, in teaching the perfect form of the auxiliary should (should have), which is a rather difficult form for foreign students to use (Exercise-Lesson 42), I always proceeded as follows: First, I would run over the exercises several times until the students could do the exercises in the book perfectly. However, I knew from many years of experience in this work that there is a great difference between a student's being able to do the exercises in the book and being able to use the particular principle in speaking the language. Consequently, I then always explained to the class that I was going to give them a little additional oral drill so that they could practice using this form in their everyday conversation. I would then give them a series of statements which they were to consider as statements of error. They were to correct each of these statements using in their answers, first, should have in the negative form and, second, should have in the positive form. For example, I would say to the first student, "I waited for you last night on the corner of 33rd Street." He had to reply, "You shouldn't have waited for me on the corner of 33rd Street. You should have waited for me on the corner of 42nd Street.'' To the next student I would say, "I sent that letter by ordinary mail." He then had to answer, "You shouldn't have sent that letter by ordinary mail. You should have sent it by airmail." To the third student I would make a similar statement, and thus I would pass all around the class until each student had had one or more practice exercises using shouldn't have and should have. I would also continue this drill for several days during the review section of later lessons. Naturally, after a week or so of this kind of practice, every student in the class understood the principle well and could also use it in his everyday speech. Furthermore, the students always enjoyed such drills. They found them fun to do, and they felt that they were actually speaking the language rather than just learning grammar theory from a textbook. Fifth, institute some regular system of review so that a good part of each lesson is devoted to the repetition of material of earlier lessons. In this way things learned today are not forgotten tomorrow. Instead, everything which has been studied is kept constantly fresh and active. Sixth, for purposes of variety, occasionally dictate exercises to the class and make the students write as you dictate. They can fill in correct verb tenses, correct mistakes, change to negative or interrogative form, etc. If the above suggestions are followed, I am sure that the teacher will find that her lessons will become much more effective. The teacher need not adopt all the points mentioned here; she can add other ideas which may fit her particular class situation better. But if, in general, she follows this oral approach and adheres less rigidly to the exercises in the book, she will find that her lessons will be more animated, her students will respond more eagerly to the task at hand. The students will also be able to make practical use of everything which they study, and thus the purpose of this book, as I have conceived it, will have been well achieved. NOTE: For further conversational practice with the grammar principles of this book, the textbooks Direct English Conversation for Foreign Students, Books I and II, are strongly recommended as supplemental texts. The books have been written to accompany each other, and the exercises of this book parallel the exercises of the conversation books, lesson for lesson. To yamha: know you do, my friend. About the book: This is intentionally made for teachers rather than students and has no answers keys. this file is not open in acrobat reader. please give the converter or software to open this file. To mandeep145: For DJVU files you need WinDJVU or DjVuReader. Thanks dear arcadius for the update , I have updated the link at the header. Thanks, Ayman Sorry for causing you trouble. Won't happen again. You changed the avatar... Don't tell me that's you with your kid. He/She's so cute!! !